Heat oven to 425°F. Cook and drain macaroni as directed on package, using minimum cook time. Meanwhile, in 3-quart saucepan, melt butter over low heat. Stir in flour and mustard with whisk; cook and stir until smooth. Gradually add milk. Heat to boiling, stirring constantly. Boil 1 minute until mixture is hot and bubbly. Add Cheddar cheese; stir until cheese is melted and sauce is smooth. Season with salt. Gently stir cooked macaroni into cheese sauce. Stir in chicken. Spoon into ungreased 8-inch square (2-quart) glass baking dish. 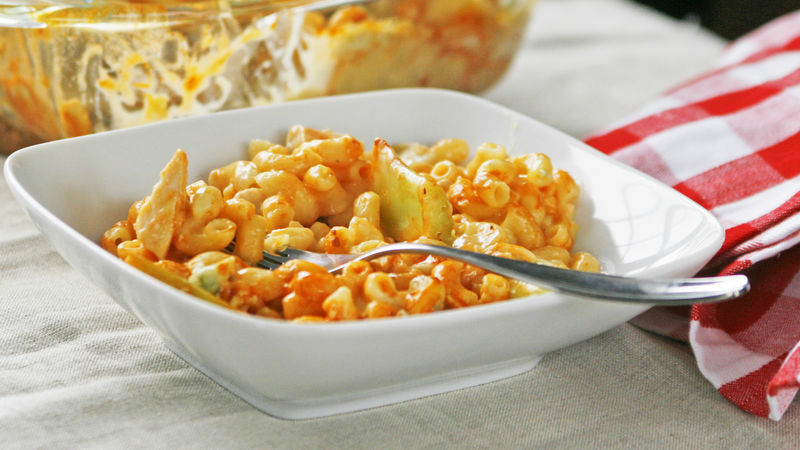 Sprinkle celery and blue cheese over macaroni mixture. Drizzle with Buffalo wing sauce. Bake uncovered 5 to 10 minutes or until bubbly and blue cheese is melted. Serve immediately. Not a celery fan? Although it’s amazing warm in this, it’s also okay to omit it. The cheese sauce will seem like too much for the macaroni, but it’s not. The baking dries it out a bit, so the amount of sauce is necessary for the creamy goodness of this dish. With the combination of spicy chicken flavors and cheesy pasta goodness, buffalo chicken mac and cheese is the ultimate comfort food mashup. The sauce that covers your chicken and pasta is what will send this recipe over the top, and you really can’t make too much of this cheesy topping. Read up on Betty’s tips for perfecting your mac and cheese if you want to make your best mac ever. And if you can’t take the heat, you can get your comfort fix from one of Betty’s other mac and cheese recipes.